– The strengthening of the leather and fetish scene. – the support of charitable associations and organisations in Europe taking care of people with hiv and aids.Folsom Europe is a peaceful and friendly meeting of this scene and its friends. Women and men from around the world meet each other, to help others and also, in order to advertise for more acknowledgment and respect for her/its/their way of life. Rubber men are an important part of the leather community.This year the Folsom Europe was arranged with a detailed program from September 1 to September 6, 2010. Folsom Europe is the only festival of its kind in Europe. The 7th Folsom Europe Street Fair was arranged on Saturday September 4 on Fuggerstrass/Welserstrasse in Berlin Schöneberg between noon and 9 p.m. More than 20.000 people participated at the street fair according to the police´s estimation and over 5000 at the two Folsom parties PERVERTS and PIG (2008 numbers). Folsom Europe is organized in a charity which means that the majority of the money goes to beneficiaries, especially to support preventative work in the area of hiv and aids. At the entrances of the street fair the Sister Of Perpetual Indulgence (picture right) ask for donations. Under the motto Safe, Sane and Consensual, the Women, Trans, Inter, Lesbian community participated during Folsom Europe. International Mr. Leather 2010, Tyler McCormick (picture), visited Folsom Europe 2010. Here he is interviewed during the Street Fair on Saturday 4, 2010. 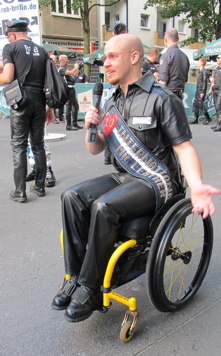 Tyler McCormick, Mr. Rio Grande Leather of New Mexico, was named International Mr. Leather at the 32nd Anniversary IML Competition in Chicago May 30, 2010. McCormick, a female-to-male transgender man who uses a wheelchair, bested a field of 50 contestants, from across the U.S. and around the world.